When perpetrators of violence are people of color, journalists, politicians and many citizens treat their violence as natural, expected. But when shooters are white men who kill white victims, politicians like Trump, and indeed many other facets of white America, reach for the notion of an unstable, angry, isolated person driven to mass murder. That description is a relatively new one: the image of a disturbed, gun-obsessed, white male loner who presents a threat to mainstream society emerged alongside the rise of mass shootings over the past two decades. To take but one example, in the aftermath of Newtown, headlines repeatedly described killer Adam Lanza as a deranged “loner” who “felt no pain.” In this talk, Prof. Metzl addresses how the automatic assumption that white shooters are isolated, deranged individuals conveys the subtle message that whiteness in general, and white masculinity specifically, is not connected to any larger cultures, networks or ideologies that might foment violence. Such framing allows Americans, white Americans in particular, to avoid pondering any number of larger narratives that might provide wider contexts in which to understand the trauma of modern-day mass shootings—and that might force us to consider taking charged or controversial actions to prevent them. 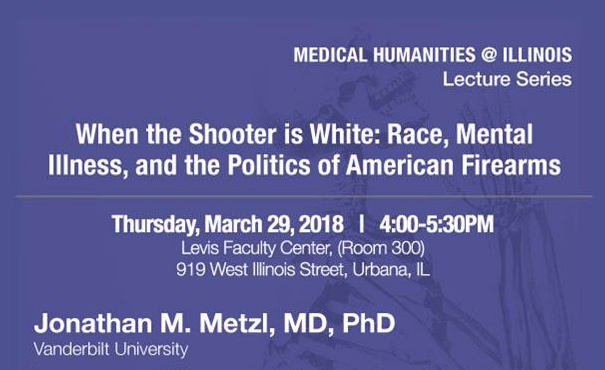 This lecture is organized by the Medical Humanities Research Cluster, with the support of IPRH and the Carle Illinois College of Medicine, and co-sponsored by African American Studies, Anthropology, Asian American Studies, Communication, Interdisciplinary Health Sciences, Latina/Latino Studies, Kinesiology and Community Health, Media & Cinema Studies, Psychology, Sociology, and the Unit for Criticism and Interpretive Theory.